Most San Juan Capistrano parents know children’s oral health basics: brush regularly, reduce sugar intake, limit snacking, and get adequate amounts of calcium and Vitamin D. Hales Parker Dentistry recommends three additional tools for preventing cavities in toddlers and children. Resin dental sealants are applied by your Rancho Santa Margarita dentist. The material bonds to the chewing surfaces of the back teeth, protecting the pits and fissures from decay. Some California dental insurance providers cover dental sealants, so check with your provider if you are considering them. Fluoride supplements help strengthen still-forming teeth prior to eruption. You can get a prescription from your San Juan Capistrano pediatrician or talk to us at Hales Parker Dentistry in Ladera Ranch. There is one caveat, however: if you have fluoridated water, your pediatrician may advise against taking additional fluoride in supplement form. If your child is taking fluoride supplements, is an oral rinse redundant? Actually, no. Fluoride supplements help strengthen teeth that are still forming, but a fluoride rinse helps teeth that have already come in. Oral rinses containing fluoride can be purchased at any Mission Viejo, Las Sorres, or San Juan Capistrano grocery store. Make sure you buy one specifically formulated for children. Products labeled as a mouthwash are usually intended only for breath-freshening and may not contain fluoride. I recommend San Juan Capistrano children use an oral rinse after they brush and floss at night. They are most effective when they are the last substance on teeth before kids go to bed. 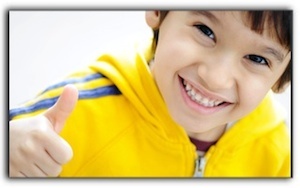 At Hales Parker Dentistry, we believe that with proper preventative dentistry, Rancho Santa Margarita area kids can enjoy healthy teeth for life.